Have you ever been so exhausted and in no mood to make dinner? If not, I want your life! A little over a month ago, I didn’t make it to the gym in the morning, so I had gone after work. This means I usually don’t get home until close to 7:30, and that’s leaving work early. Not that 7:30 is late, but for us oldies, we are usually in bed by about 9:00 on weeknights, so dinner is usually on the table by about 6:30. Lame, I know. So on that particular evening, I stopped by Papa Murphy’s to get us a take and bake pizza. 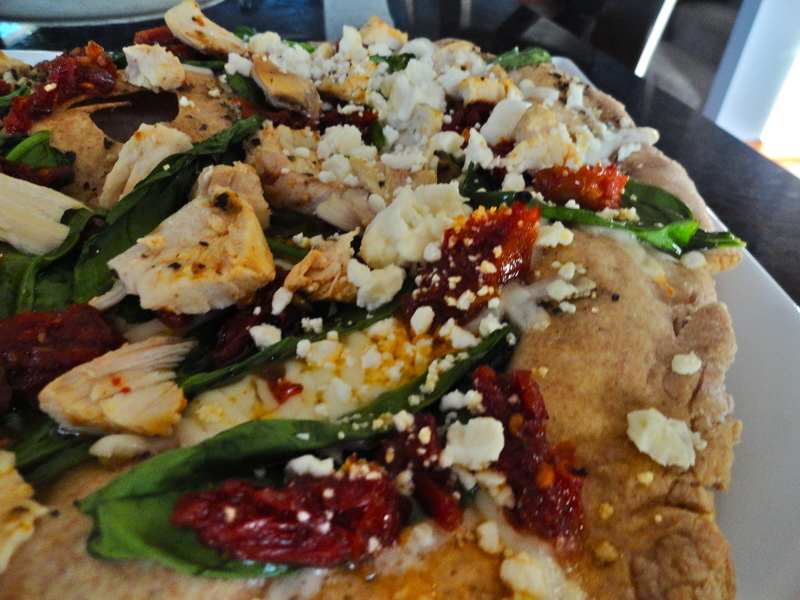 The deLITE herb chicken mediterranean pizza sounded interesting, so I went with that. We both really liked it. So much so, that not only did we devour the entire thing, but it made its way to our kitchen two more times in the next two weeks. 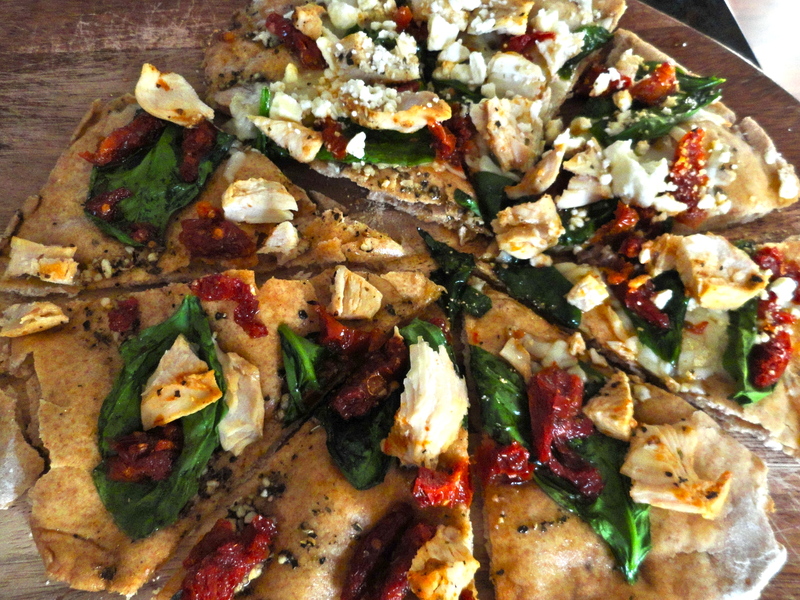 I figured before we spend all of our wedding savings at Papa Murphy’s, I better try to make this at home. This is also why I pre-made two batches of pizza dough, separated it, and froze it. This way I could make pizza at the drop of a hat, instead of waiting a few hours for the dough to rise. I’m pretty sure this was just as good as the take and bake from Papa Murphy’s! I rolled the dough out really thin so it was similar to their deLITE crust, and it came out perfectly cracker thin and crispy. The toppings make this pizza ultra light and doesn’t make you feel bad when you grab yourself a second slice…or forth 😉 Because who wants to deal with that guilt, especially when swimsuit season is just around the corner! Do yourself (and your body) a favor, skip delivery and make this at home. You can thank me later! 1. Prepare pizza dough to specifications. 2. In a small bowl, combine olive oil, garlic, basil, oregano, marjoram, salt and pepper. Brush evenly over pizza crust. Cover oiled crust with mozzarella. 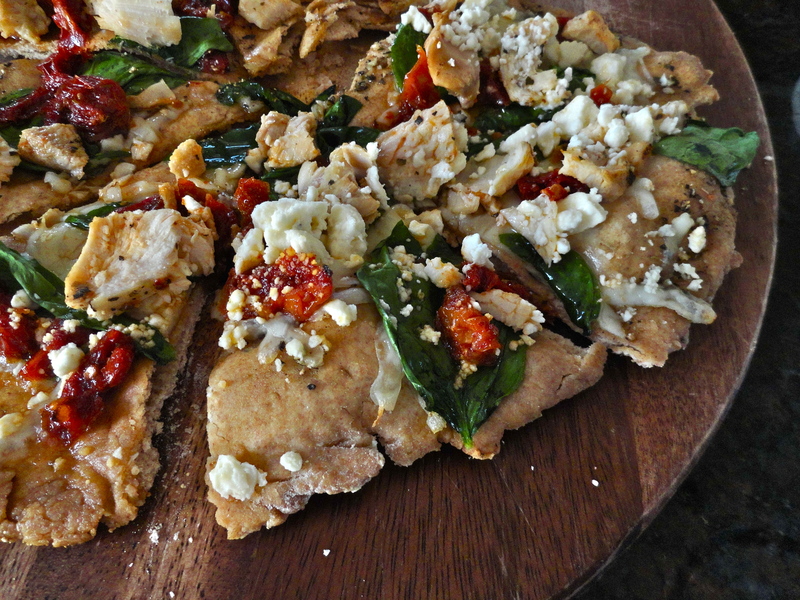 Evenly distribute spinach, tomatoes, chicken and feta over pizza. Return to oven and cook until mozzarella has melted and crust is desired crispness.